Hi again. It’s so good to have you back. 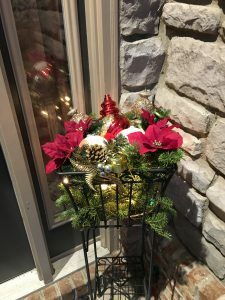 Today I want to show you how I used the leftover branches from the bottom of our Christmas tree to make this beautiful decorative basket for our front porch. 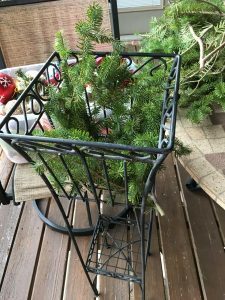 Begin with any shape outdoor planter or plant stand and the leftover branches from your live Christmas tree. First, you will want to remove any bare branches. The thicker the greenery the better it will look for the finished product. 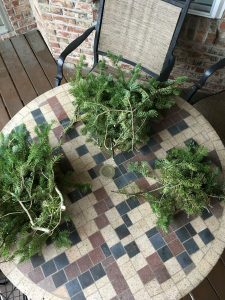 To make the process go more smoothly, I separated the greenery into three piles. I made a pile for small branches, medium branches, and, you guessed it, large branches. 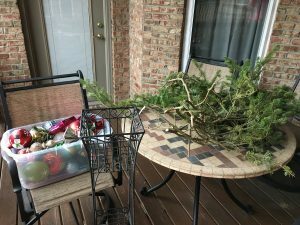 Begin lining your container with the large branches. You want to get a good base. It needs to be thick enough no ornaments or decor falls through, but thin enough the light still shines through at night. 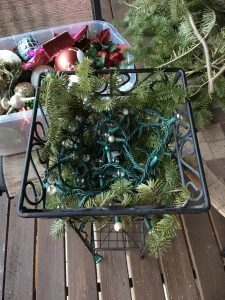 Next, if there is a power source available, add a single strand of outdoor lights. (If there will be no source for power where you plan to place this Christmas decoration you do not need to add lights. The ornament basket is beautiful even without lights!) 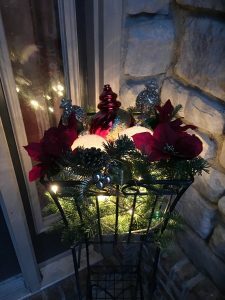 For this years Christmas decorations, I used red, white and green lights in the front of the house, so I used white lights in my basket so it would fit with the color scheme. When adding the lights, you can work them into the branches a bit. Your goal here is for the light to shine through but not to be able to see the light bulbs during the daytime. 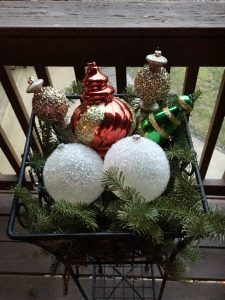 Next add your outdoor or shatterproof ornaments. Again, I stuck with the red, white, and green theme but any assortment of colors will be beautiful. You can match your outdoor decor. To give the basket a polished look I finished it off with more greenery – this time from the “small” pile. 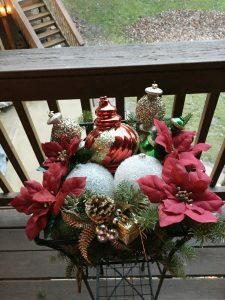 I also added a floral pick and a few poinsettias blooms. Isn’t is even more lovely at night!